What is behind the Canadian housing boom? Rising wages? Rich immigrants? The government? Indeed it was the government relaxing mortgage rules in the mid -2000's which led to home prices doubling and even tripling in some places. As home prices rose, so did the debt. Household debt increased from 110% in 2000 to 165% in 2013. After numerous property busts around the world in 2008, the Canadian government quickly reversed its housing policy by tightening mortgage rules, eliminating 40, 35 and 30 year mortgage terms. While the Canadian housing bubble is yet to pop, the risk is still out there. 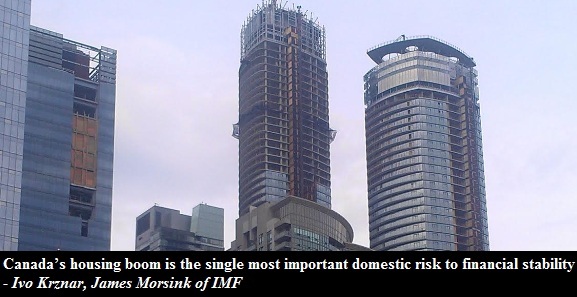 In fact the IMF believe that the housing boom is the most important risk to our economy.